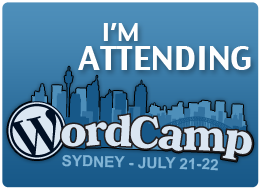 If you haven’t already heard, WordCamp 2013 is on in Melbourne! It’s a fantastic community-focused event and the line up of speakers is spectacular! WordCamp is the perfect two day conference for anyone who’s passionate about WordPress whether you’re a beginner or advanced, whether you want to design or develop there are a range of great speakers covering a variety of topics including content management, blogging, e-commerce, community building and more. Make sure you don’t miss out and grab your ticket today, it’s only $50.00 for two days of WordPress goodness.